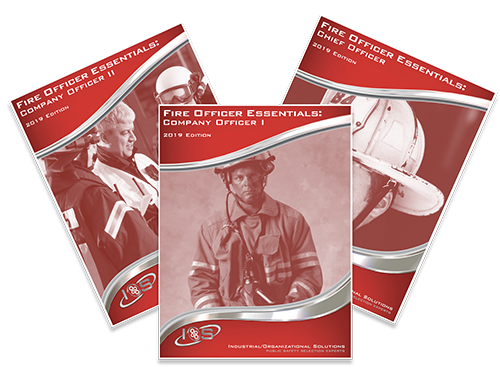 The Fire Officer Essentials promotional examinations for Company Officer I, Company Officer II, and Chief Officer were developed specifically for fire agencies to determine the extent to which candidates possess the necessary job knowledge required for success as fire service supervisors. The exams were developed based on job analysis data collected from fire departments across the nation. The job analysis results provided the empirical data for determining the relevant knowledge areas that are evaluated by the Fire Officer Essentials examinations. Whether you use one of our stock examinations or work with IOS to generate a semi-custom examination, IOS’ Fire Officer Essentials examinations will provide an optimal solution for promoting individuals within your agency. Free Local Validation: You are strongly encouraged to complete a Local Validation Survey to support your department’s use of the exam. IOS will assist you in ensuring that the use of the examination is valid for your agency. Free Cut-Score Analysis: You are strongly encouraged to complete an Item Review Survey to establish a local cut-score for the examination. Using the stock version of one of the Fire Officer Essentials examinations as a base, IOS is able to remove or replace items to tailor the examination to your agency’s specific needs. To establish the evidence needed to modify the examination’s parameters, you will be asked to complete two surveys– one will involve rating specific knowledge areas and topic areas with relation to the target position within your agency, while the other will involve rating the relevance and appropriateness of the exam items selected for your department. You will also provide ratings of item difficulty in order to determine a cut-score for the examination. *The semi-custom exam option does not include custom item-writing. If you are interested in an examination including items written from departmental or other source materials, please contact IOS’ consulting division.